That a dog is a man’s best friend is not just a mere saying. Since time immemorial, dogs have been loyal companions, protectors, helpers, life savers, and providers, just to mention but a few. In a nutshell, dogs are awesome creatures, worthy companions, and loyal to the core. If you are a dog lover, it is very difficult to imagine living without one. You probably relish your dog’s loyalty, how it wags its tail when you are about to give it food or simply how it barks playfully when welcoming you home from work. To keep your dog happy and enjoy every moment, you need to ensure it is safe and healthy. One fact about dogs is that they are playful and active. Indeed, this is what makes them lovable. However, being playful can easily land them into problems even when they never intended to disobey orders. When your dog is left unsupervised, it can easily stray beyond your compound. This could mean trouble such as getting attacked by other dogs, getting lost or injuries from accidents. While the problem is indeed dire, it is impossible to simply keep the dog indoors! The solution is a wireless fence. This is a simple and reliable method of dog containment while letting it remain in the open. To help you pick the best option, I have done the legwork for you and bring you the most comprehensive wireless dog fence reviews in 2019. How Do Wireless Dog Fences Operate? What exactly is a Wireless Dog Fence? 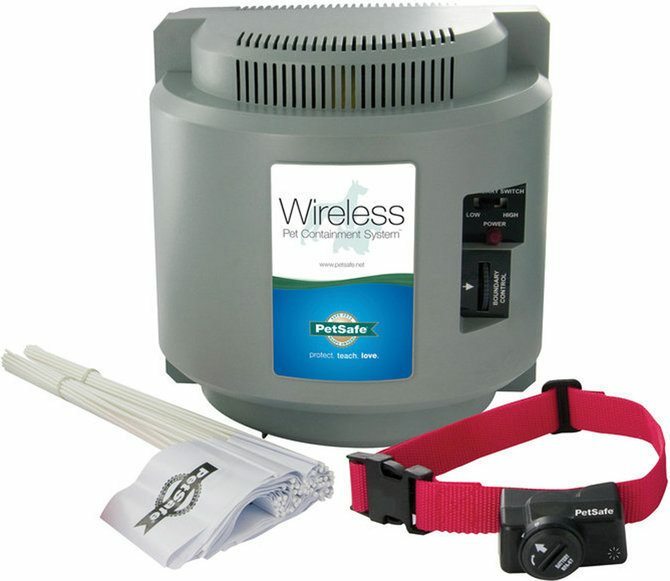 Wireless dog fences are wireless containments designed to help keep dogs within a specific range that is considered safe. The principle behind the fences is to create an imaginary secure area without installing a physical barrier. The electric wireless fences are largely made of two pieces of equipment: a dog collar and a transmitter. The transmitter is used to emit a radio signal within the preferred range. They also allow you, the dog owner, to set the range or distance that serves as the boundary. The other section of the fence is the collar or receiver. It is placed on the dog’s neck and features points that come into contact with the skin. As long as the dog stays within the safe zone, it is free to roam and the collar remains dormant. When the dog approaches the boundary, the receiver releases a warning beep that signals your dog not to proceed. If your dog ignores the warning and proceeds to cross the set boundary, the receiver releases a small electric shock that startles the dog. If you are worried about the intensity of the shock, be advised that it is mild and will not in any way harm your animal. As your dog adjusts, it will learn to stop when the beep goes off and, therefore, remain within the secure area. Size of your property: Go for a wireless dog fence that can cover maximum area. Nature of landscape on your property: Because radio waves travel in straight lines, make sure to determine whether there are barriers such as metal objects that can compromise communication between the transmitter and collar. The number of dogs: Many wireless fences are designed to support only a few dogs. However, there are others that allow users to buy compatible collars for more dogs. The collar battery: Because the fence collars operate on batteries, it is important to select a design with longer battery life or one that is rechargeable. As the demand for newer and more effective wireless fences keeps growing, the following reviews help you to dive deeper into the top brands. Do not simply pick any fence out there; go for the best wireless dog fence that guarantees top results. View Current Price on Chewy! PetSafe 12.8 ounces (0.3 kilograms) Yes No View Current Price on Chewy! PetSafe 3.17 pounds ( 1.4 kilograms) Yes Yes View Current Price on Chewy! Yes Yes View Current Price on Chewy! PetSafe 9.6 ounces (0.2 kilograms) No No View Current Price on Chewy! PetSafe 5.4 pounds (2.4 kilograms) Yes Yes View Current Price on Chewy! PetSafe 4.6 pounds (2.6 kilograms) Yes Yes View Current Price on Chewy! 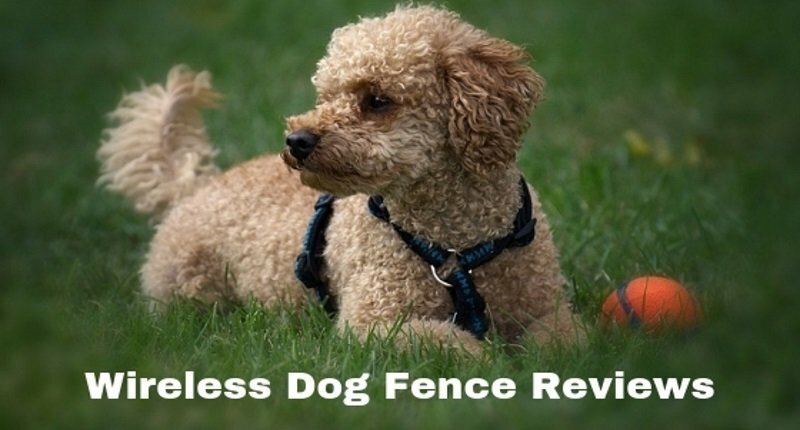 This wireless invisible dog fence is the top pick in this review because of its efficiency when it comes to security, safety, and convenience. 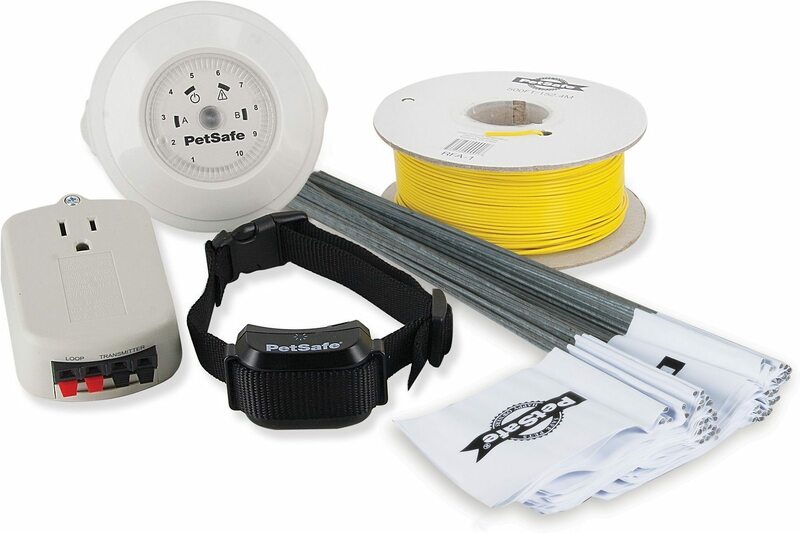 Unlike some electric dog fences that require users to lay cables on the yard, the PetSafe Wireless Pet Containment allows you to set a safe range within the comfort of your house. No digging or laying cables is needed. 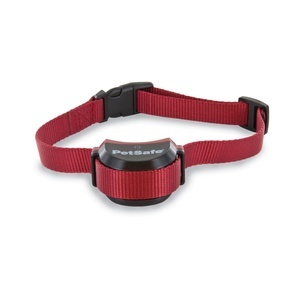 The wireless fence comprises a small unit and a collar that you place on your dog’s neck. It releases a warning beep that is easy for dogs of different ages to understand when they go close to the boundary. 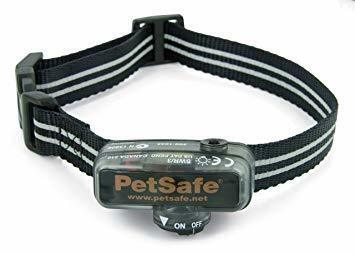 It also has a static correction that is safe for your dog when it strays outside the main boundary. I found the fence impressive because it has a training guide to help you optimize all the features. To get better results from this wireless fence, it is advisable to ensure that your dog knows and obeys commands such as “stop”, “sit”, and “stay” among others. The PetSafe Wireless Pet Containment fence is effective because it provides five adjustable levels of correction. This implies that if the dog misses or does not stop after getting the tone warning, it will be stopped from going beyond the set boundary by other correction levels. To ensure that the collar battery is replaced on time, the transmitter notifies you when it is getting low. The only concern with the fence is the large wobble range of 4.8 feet (1.4 meters) that could make it difficult for the dog to easily tell the exact point of the boundary. This wireless dog fence is another top pick in this list because of its ease of use and efficiency. It comprises two main units: the transmitter and the dog collar that should be placed on the dog neck to contain it in a safe area. The PetSafe Stubborn Dog Stay+Play Wireless Fence Receiver Collar is designed with five levels of static correction and a tone. It uses a sound warning when the dog approaches the fence and different shock levels if it does not stop. I was impressed by the fact that the collar can be used on most dogs starting from the small ones weighing as low as 5 pounds (2.2 kilograms). The collar size can also be adjusted to fit dogs with necks ranging from 6 inches (0.1 meters) to 28 inches (0.7 meters). To make the collar comfortable for your dog, it is designed with adjustable contacts so that it can work well for both long and short-haired pets. This helps to reduce skin irritation. The main issue I found with this wireless dog fence is that it is expensive. Its price tag of $144.95 is way higher than other top options such as the PetSafe Extra Wire & Flag Kit. Are you aiming to buy a cheap yet highly effective dog containment fence? 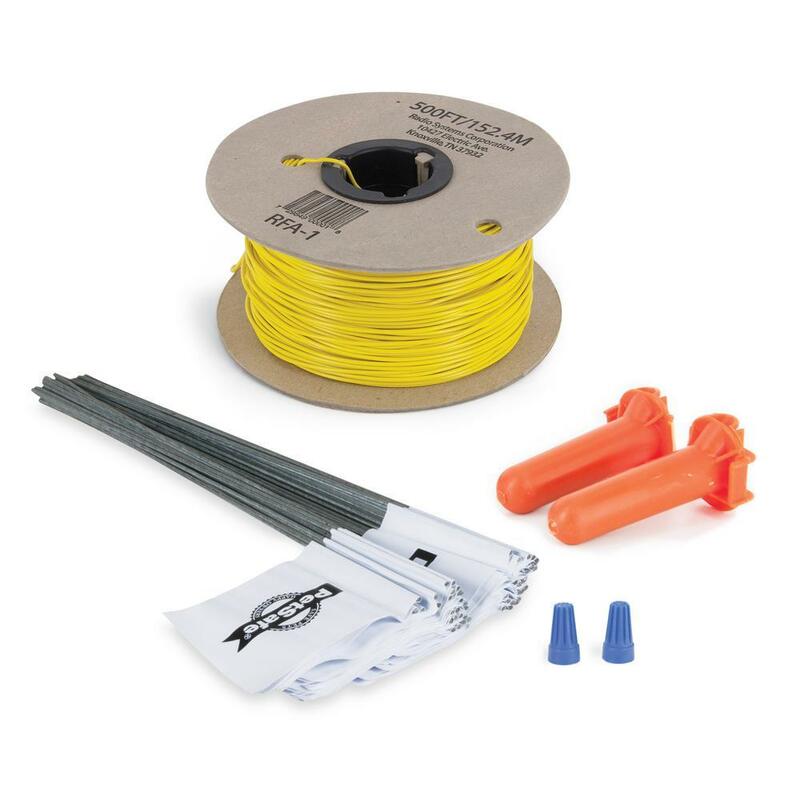 This PetSafe Extra Wire & Flag Kit is one of the leading wireless dog fence options out there because it covers a wide range of up to 500 feet (about 1/3 of an acre or 152 meters) and is sold at a cheap price of only $31.89. The fence requires you to bury the insulated copper wire that defines the safe area for your dog. Note that you can extend the safe area using a longer copper wire. To make it easier for your dog to recognize the boundaries, the fence also comes with visual reference flags. These are very helpful especially when you are training your dog to change its behavior. The main challenge of using this fence is that the perimeter wire has to be buried under the ground. This makes it difficult to set the containment in a hurry or shift it to a public park. While most wireless dog fences are designed for big dogs, you might be wondering about the best option to contain the smaller dogs. 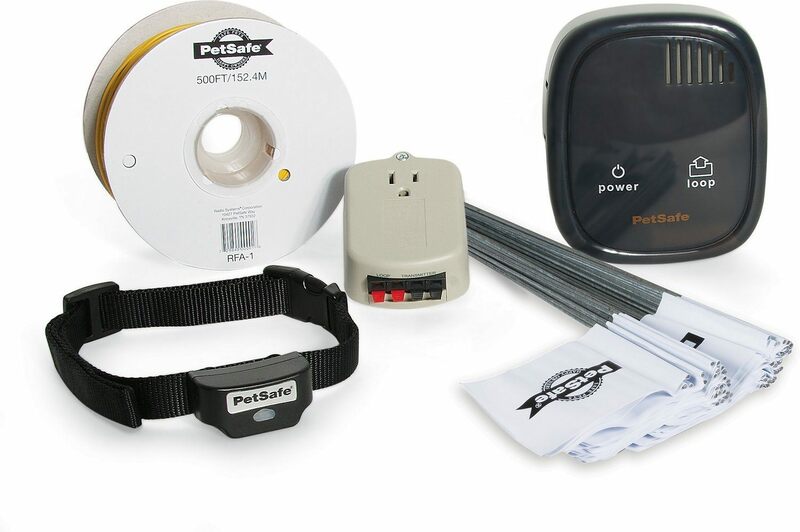 The PetSafe Elite Little Dog In-Ground Fence Receiver Dog Collar is meant to provide small dogs with ample area to explore and learn without straying away to dangerous regions. The wireless fence requires you to install a perimeter wire on the area you consider safe. The wire can cover up to an area of 25 acres. This area is large enough for your dog to roam safely in the backyard or in public parks. 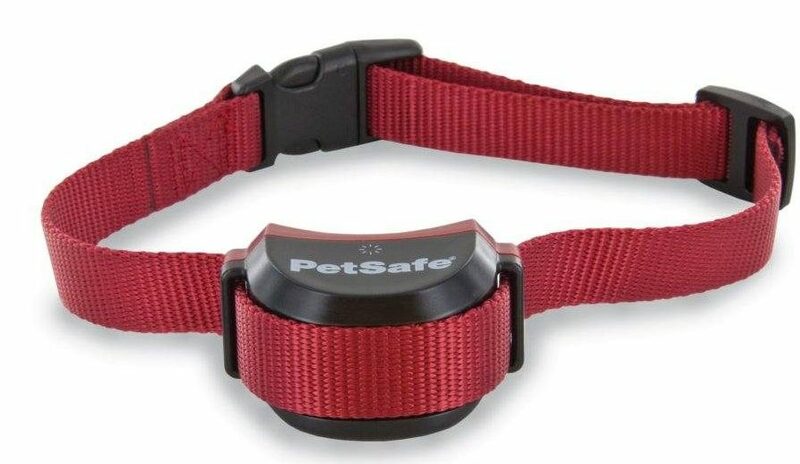 The collar is waterproof and can be used to contain and train your dog even in wet conditions. This implies that you can effectively contain and train your dog even in rainy or snowy conditions. The collar is designed with four static corrections and one tone only; this makes it easy to train your dog about the safe area. The main issue with this wireless fence is that you will need to install a ground wire in the perimeter of the safe region. Besides, the fence is designed for small dogs. Therefore, you might need to buy a different containment fence when the dog grows bigger. While most of the wireless electric dog fence options discussed in this post focus on keeping the dog safe when outdoors, it is also important to know that danger can also be indoors. Indoor containment could also be aimed at ensuring your pet does not damage things such as the couch or other areas. 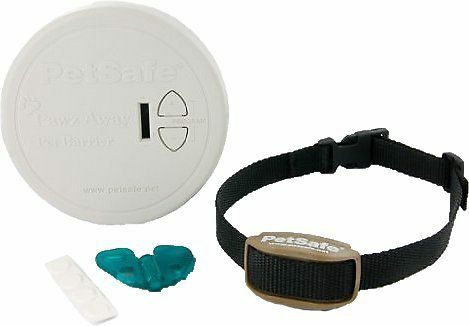 The PetSafe Pawz Away Indoor Pet Barrier is used to provide an indoor barrier to help your dog stay away from the counters, couch, or even trash. The electric wireless fence comes with a dog collar and a transmitter that operates within a radius of 6 ft (1.8 meters) radius. When your dog approaches the boundary, the collar releases a warning tone, cautioning the dog it is approaching a prohibited area. If it continues, the collar releases progressive static that lasts for three seconds until your dog leaves the prohibited area. The main issue with PetSafe Pawz Away Indoor Pet Barrier is that it can only be used indoors. Therefore, you might need another electric wireless fence to contain your pet outdoors. This is another top quality electric wireless fence from PetSafe meant to contain your dog within a large area of 1.3 acres (0.1 hectares). However, you can still extend the safe area to five acres (2 hectares) by adding the containment perimeter wire. The collar used for the fence is lightweight and can be used on dogs with neck sizes of 6-28 inches (0.1-0.7 meters). This implies that the fence will work well on your dog whether it is small or big. To help you contain and train the dog in all weather conditions, the collar used on this fence is waterproof. All the four static correction levels will not be affected by water or extreme temperature of the summer. This means that you can purpose it to train the dog for a few hours every day irrespective of the prevailing weather condition. If you have a small dog of about 5 pounds (2.2 kilograms), the PetSafe Rechargeable In-Ground Pet Fence is one of the top electric dog fence options in the market today. The fence comprises a transmitter, dog collars, and a cable that should be laid on the perimeter of the safe zone. The collar used on the dog is waterproof and can be used even on dogs that like playing in wet areas such as the water pool. In addition, it has a lithium-ion battery that can last for up to five years. The fence covers a maximum of 25 acres, which is ample for most pets to play and explore. If your pet approaches the boundary, the fence releases a warning beep or mild shock. With continued use, the pet can be properly trained to follow the instructions in two weeks. I was impressed by the ease of setting and using this electric fence. The transmitter allows you to change the static correction shocks and sound signals depending on the size of your dog. This flexible design has made it possible to even use the fence with smaller pets such as cats. The main shortcoming of this wireless fence is that you will need to lay the cable on the perimeter of the safe area. If you love your dog, the best thing to do is keep it safe all the time. But because dogs are naturally playful, the best method to protect them is by installing a wireless electric fence that keeps them within the area you are sure is safe. Though many companies have released different types of dog fences onto the market, it is advisable to only go for the best. The above best wireless dog fence reviews provide insights into the top seven options that guarantee your dog optimal safety and ease of use all the time. Do not simply buy any fence out there; go for the best wireless dog fence with top features that guarantee the highest value for the money.